A current modelling trend embracing 1/32nd scale has resulted in some stupendously detailed new kits being released, some of them more redolent of model engineering than modelling. But there are some very nice old stagers out there too, kits both of unusual subjects and of surprising quality for the time they were originally released. One such, and a rarity, is Nitto's Type 93 Intermediate Trainer, a biplane with floats. 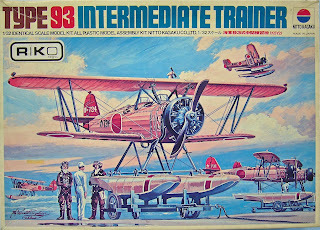 From 1962 to 1985 Nitto or Nitto Kagaku, produced many injection moulded plastic model kits of a variety of subjects and their range of aircraft kits covered biplanes to airliners in scales from 1/600 to 1/32. Their two 1/32 scale aircraft kits are both of the IJN Type 93 Intermediate Trainer, Kawanishi's K5Y, code name Willow. 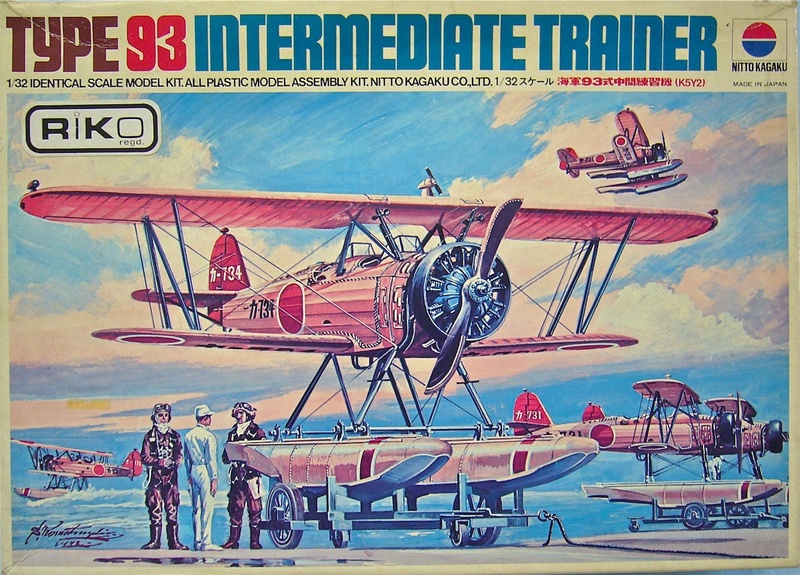 Kit number 391 is of the K5Y1 land based trainer and 392 is of the floatplane trainer, both now long out of production. The moulds are said to have been acquired by Doyusha in the late 1980's so there might be some hope of a future re-issue. My K5Y2 example, which was purchased on eBay, was originally imported into the UK by Richard Kohnstam Ltd (RIKO) and had English language instructions. 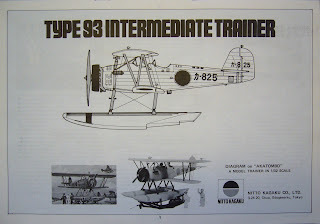 The nimble K5Y biplane trainer was given the nickname 'Akatombo' by the Japanese after its likeness of their native red dragonfly. 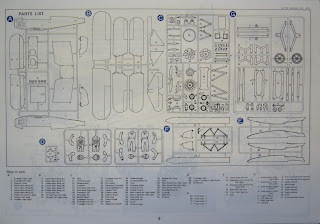 The kit contains nine sprues, four of major aircraft components moulded in trainer yellow/orange, two of mostly engine/strut parts and the beaching trolley in brown plastic, two of mechanics and crew figures in white, a spall sprue for the transparencies and lengths of stiff wire for the rigging. 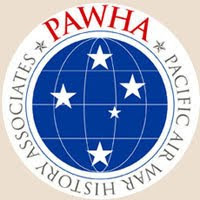 The decal sheet provides markings for two aircraft. 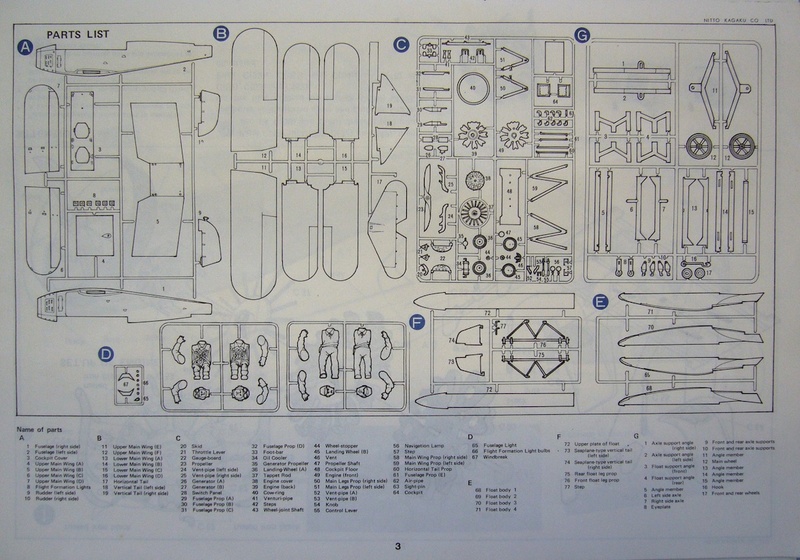 The twelve page instruction leaflet is excellent, presenting a history of the aircraft which includes manufacturing details and a parts listing with not just a diagram of the sprue layout, but also the nomenclature of each part. Expanded drawings and photos guide one through a quite straight forward assembly. 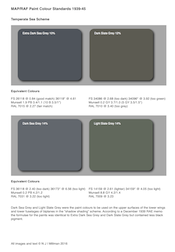 Options exist and are clearly identified as are any colour references. Interestingly, the K5Y2 also kit contains wheels and struts, so has the option of making the land based K5Y1 should one wish to do so. 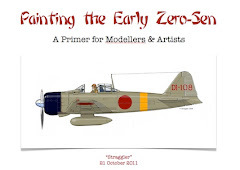 I based my own model (shown here) upon a pre-war silver-doped machine spotted in the Bunrindo Famous Aircraft of the World (FAOW) book on the Type 93. 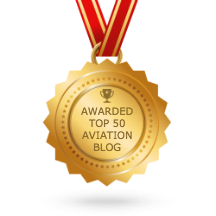 The flying surfaces and fuselage were painted Humbrol Silver and weathered, The metal surfaces around the cockpit and engine were painted Floquil Bright Silver and polished with SNJ Aluminium powder. The floats too were painted with Floquil, and weathered. The cowl was painted a mixture of flat black with a bit of blue. Due to the age of my kit the decals were very fragile and I painstakingly placed them in bits having to touch up cracks and missing sections with paint. The K5Y2 is a handsome aircraft and saw service with the IJN throughout the war. Great job on your build Gary. Thanks for sharing the scans of the kit components and your build. What more can I say, she's impressive! Her size was the only reason I did not buy her in those years.Inspiring for I bought her in 1/72 just recently. 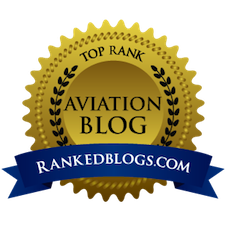 Great work Gary! I was fortunate to pick up the Nitto kit of the K5Y1 from Kit Krazy a little while ago, and am looking forward to making a start on it. The K5Y2 was on sale at the kit swap at Scale Model World last year, but was a tad expensive for my taste. I agree that, for its age, it is a very nice kit but I wonder about the accuracy of the cockpit details, particularly the rear cockpit instrument panel. However, there is nothing that can't be cured by a little bit of good old scratch building. 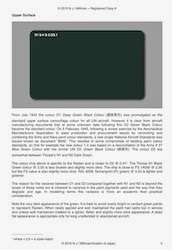 As a footnote to Gary's comments, Doyusha did in fact release both the K5Y1 and K5Y2, and in fact the most recent incarnation of this was not so long ago. HLJ currently list both of the kits, but they are currently out of stock and may no longer be available. Great work, and thanks for making me aware of this kit. I did not know that they ventured into 1/32nd scale a/c. However, I always thought Nitto was willing to do something unexpected. If memory serves, they produced a series of 1/24th scale German armor in the late 60's/early 70's. As a kid, I always thought that an odd choice. Do you still have your instructions for your Entex Willow in 1/32? I just got one from a collection and they're missing them. I hope you still do! Beautiful Work. I'll do mine in the traditional"Orange" scheme though. Only because it goes with everything else I have in Japanese Trainers! BTW does anyone have the Instructions still, for the Entex kit in 1/32? I'm sorry but I don't have this kit! 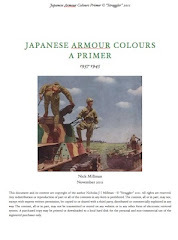 The article is by Gary Wenko of the IPMS (UK) Japanese Aviation Special Interest Group who unfortunately no longer collaborates with this blog and the kit/model was his. You could try contacting him through IPMS (UK).